Welcome to our Harbor Country vacation home … 'Breeze' at the Vineyard Lofts. Built out of what was the oldest winery in the state of Michigan, Breeze offers guests the ambiance of a bygone era with the latest in modern design. Spectacular and inspiring, the historic renovation features striking elevation changes and dramatic architectural design that creates exciting space that is as useful as it is beautiful. A stay at Breeze beckons you to relax and enjoy! The private courtyard and patio, equipped with year-round, 4-person hot tub are great outdoor spaces to unwind. Inside, a mood of undeniable luxury prevails with the look and feel of a Nantucket seaside villa. Breeze, a corner, ground-floor 1900 sq/ft loft, sleeps 5 to 6 adults in its three bedrooms; The master bedroom has 1 queen bed, bedroom two has 2 queen beds, and bedroom three has 2 twin beds. An oversized great room with 12ft. ceilings is a great place to hang out, relax, watch a movie or just be. Outside, enjoy a patio off the dining area, or your own private, fenced courtyard off the bedrooms. If cooking is your pleasure, the fully equipped sky-lit kitchen features stainless steel appliances, maple cabinets, a prep island with electric outlet and granite countertops, affording the chef in you the perfect environment for preparing the most gourmet meals. 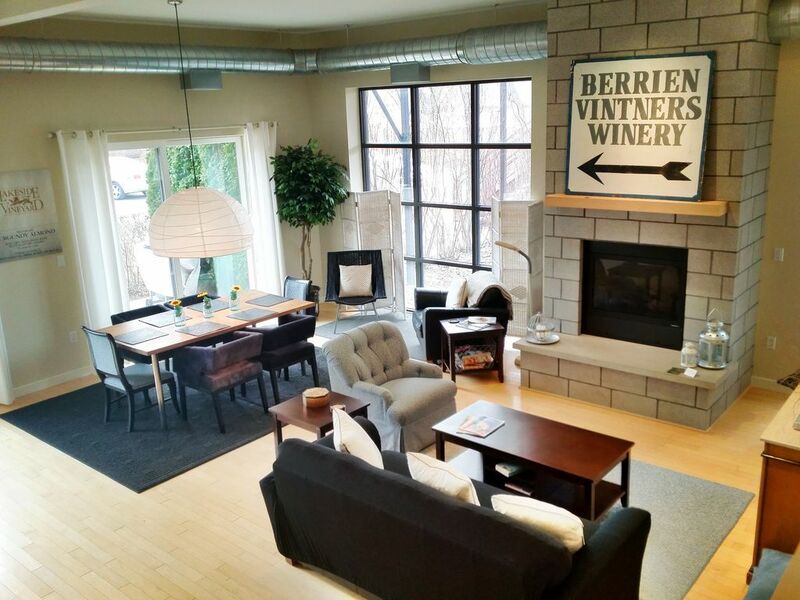 Nestled in the heart of Harbor Country, Breeze at the Vineyard Lofts is within walking distance to a great dog park, fine dining restaurants and unique specialty shops. It’s a straight shot to the beach and is centrally located to all Harbor Country activities. Best of all it is just minutes from I-94 exit ramps. We love to travel; been all over the country. We consider ourselves to have a keen sense of what works. Also, we often travel with our dog. Harbert is one of those great destinations that once you find it, you hope stays a little bit secret. The restaurants, shops, beaches, culture and all around vibe are unmatched. The Lofts are nothing short of spectacular. Carved out of Michigan's oldest winery, the historic property is unlike anything we have ever experienced. Super design, quality and vision are all present. A straight shot to the beach, two restaurants and a bakery, galleries, salon/spa, garden center and antique shops, all steps from your door. Many wineries and breweries are a 5-minutes, or less, drive down country roads. A dog park is next door at Harbert Park which also has a playground, sand volleyball court, fishing pond, pavilion, and a baseball diamond. The Warren Dunes are less than 3 miles away. On site we have a fire pit, picnic pavilion, and a serene prairie with footpaths and relaxation areas. toilet, combination tub/shower, Bath tub is 6ft. soaker tub in Master Bath. Gas fireplace turns on with the flick of a switch on the wall. We provide towels and beach towels. Please take only the beach towels to the beach and outside for hot tub use. some spices, coffee, coffee filters, tea, sugar/sweetener packets, non-dairy creamer, olive oil, cooking spray etc. Basic Comcast/Xfinity cable in Living Room and Master Bedroom. Books and magazines for light reading are located in the living room TV cabinet, as well as in each bedroom. Cards, dominos and some board games located inside the TV cabinet. Fenced in back patio equipped with table and chairs for 4, hot tub for 4, and a 10ft. patio umbrella to cover the hot tub for added privacy. 4 person hot tub can be used year-round. Prairie path that also leads to nearby Harbert Park Playground, Fishing Pond, Ice Skating Rink/Sand Volleyball Court, and Dog Park; fire pit and Gazebo with picnic bench on property - wood provided at fire pit. Great place for a family stay! Very spacious and everything you need! This is our annual girls trip space! Love it and the local wineries! This was a great place to stay and enjoy the wineries in the area- definitely close to many great wineries. The place is large, nice and open for a group of 4-8. The management was responsive and super helpful and put in some special touches to make sure we felt at home. I only wish the living space had another couch for lounging and that it heated up better. In addition, the beds were not the greatest. The hot tub was a nice touch and the rooms were huge. Thank you to the property managers for making our stay nice. Very nice place. Very clean and comfortable. Rich always helpful and accommodating. Was a little disappointed cause great restaurant next door and bakery there website raves about were closed and the beach that was a easy walk was was inaccessible due to stairs being damaged. But what can you do? Feb not such a good time to visit. Hot tub was fantastic though! Very pet friendly! Thank you for your review. February is a quiet month here in Harbor Country, but some people come here for just that reason... to unwind and relax and slow down after the holidays. We're sorry if there weren't enough things for you to do during your stay, but I do hope that you were able to relax and unwind. We're just sad that your review heading says not to come here. We asked you to review our home, and yet we received comments and stars based on things beyond our control (ie. weather and other businesses accessibility). We had an awesome time-great location! We stayed in late January so many of the business were closed for the season but we planned to eat in and relax. The kitchen was well equipped with cooking utensils and there was plenty of space for cooking. The unit is very clean and well maintained and there is plenty of room for 6 adults. We also spent time in the hot tub which was on and ready to go when we arrived. There is really nothing negative about our stay, it was perfect. The Dog Park is less than 1 block away with access through our prairie and behind the firehouse. MAK Salon/Spa is across the street. Art Galleries abound throughout the area. Wine Tasting in wine country is just minutes away. Lake Michigan and Harbert Beach is less than one mile and The Warren Dunes State Park is a very short 2 mile drive. Harbert Park features a baseball diamond, Sand Volleyball Court, fishing pond, pavilion and brand new playground all right next door. Access the park by using the Vineyard Lofts walking path to reach Harbert Park and Dog Park. Walk to Cafe Gulistan Restaurant right next door or Luisa's Cafe and the famous Harbert Swedish Bakery are across the street. Four Winds Casino is a 10 minute drive which also houses The Hard Rock Café. You'll find live music at Hard Rock nightly, as well as Headlining acts in Four Wind's Silver Creek Event Center.